The liver weighs about three pounds and is the largest solid organ in the body. The liver transports oxygen, manufactures blood proteins that aid in clotting, and aids in the body's immune system function. The liver stores excess nutrients and returns them back to the blood stream. The liver produces bile required for food digestion and helps the body store sugar in the form of glycogen. It breaks down saturated fats and produces cholesterol. Harmful substances in the body such as alcohol or drugs are removed from the body by the liver. 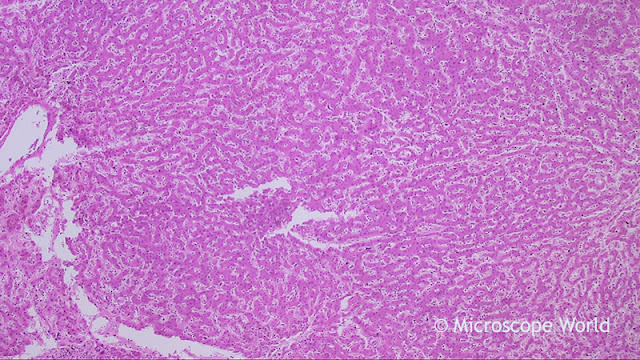 Cirrhosis is a disease in which healthy liver tissue is replaced slowly with scar tissue, eventually damaging the liver from functioning properly. The scar tissue blocks the blood from properly flowing through the liver, and slows the process of nutrients, hormones, toxins, drugs and naturally produced toxins. Cirrhosis also slows the production of proteins and other substances made by the liver. According to the National Institutes of Health, Cirrhosis of the liver is the twelfth leading cause of death by disease. Hepatitis C, fatty liver and alcohol abuse are the most common causes of cirrhosis in the liver in the United States but anything that damages the liver can cause cirrhosis, such as obesity and Diabetes (fatty liver), viral infections of the liver, repeated heart attacks and certain inherited diseases. 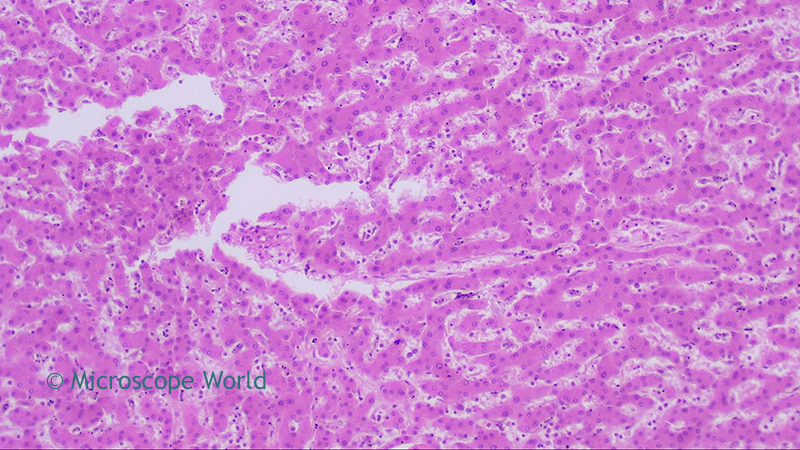 The images below of Cirrhosis of the liver were captured using the RB30 biological lab microscope and a microscopy USB camera at Microscope World. Cirrhosis of the liver under the microscope at 40x. 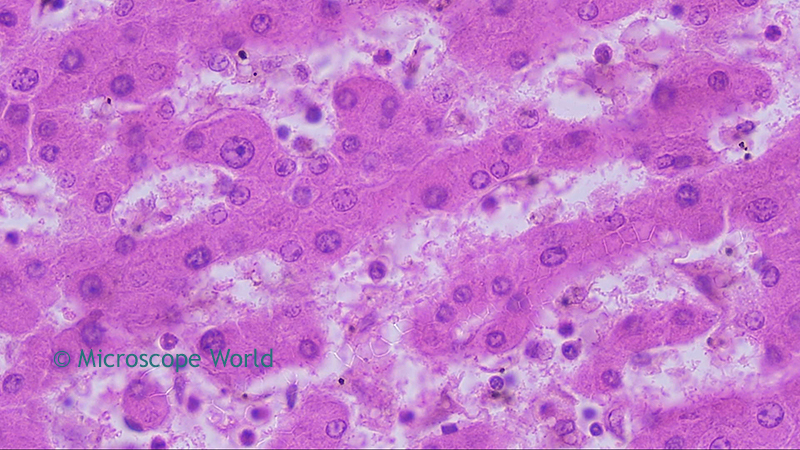 Cirrhosis of the liver under the microscope at 100x. Cirrhosis of the liver under the microscope at 400x. 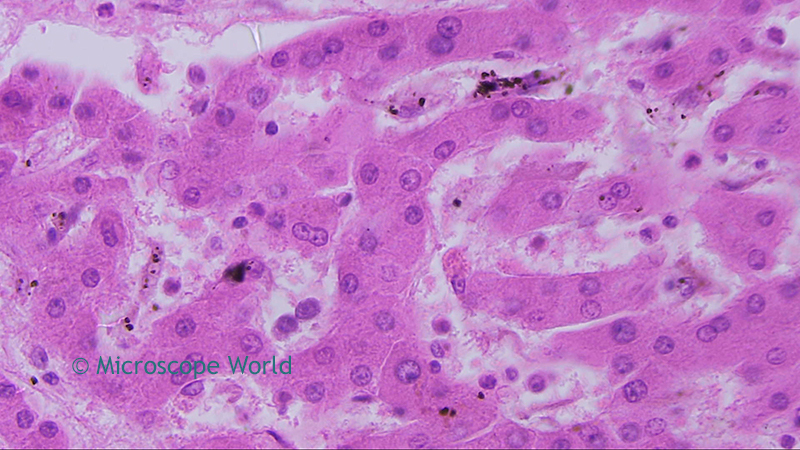 Cirrhosis of the liver under the microscope at 400x using a Plan Fluor Objective.